Birth of William Perks recorded June quarter 1880 at Dudley. 9 New Cross Street, Tipton, Staffs. William Perkes (30, Coal Miner, born Tipton), his wife Eliza (29, born Tipton), and their only surviving child from 6: Lizabeth (5, School, born Tipton). On August 6th the 7th South Staffs took part in the landings at ‘B’ beach Suvla Bay, two days later the 7th South Staffs took part in an attack on Chocolate and Scimitar Hill which went disastrously wrong. 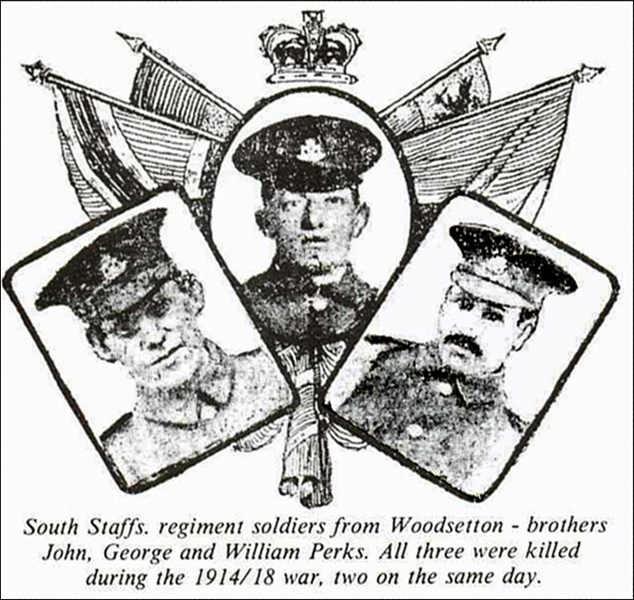 the ‘History of the 7th South Staffs’ reports 400 casualties, this is highly likely as 118 Other Ranks and 3 Officers were killed, amongst them 3 Woodsetton men: George Perks, his brother John Perks, and Abraham Braden. William Perks wrote to his parents that George had been shot through the head whilst at his side. He carried George to the Red Cross and returned to the front line, George lived for a further four hours. Before he reached the front again William was told that his youngest brother Jack (John) had been killed. William was also to lose his life, on 28th April 1917 during the Battle of Arras serving with the 2nd battalion, South Staffs, and also has no known grave. The following detail is taken from the excellent book “When the Whistle Blows” by Riddoch and Kemp on Sportsman’s Battalion – the 17th Middlesex. The Battle of Arras (1st Battle of the Scarpe) commenced on 9th April 1917, acting as a northern distraction to the Nivelle Offensive on the Aisne which was intended as a major French breakthrough. The British attack brought numerous successes including the capture of Vimy Ridge and the village of Monchy. By 15th April the advance had slowed, and Haig ordered a temporary halt so preparations could be made for the next series of attacks. The objective for 1st Army (which included the 2nd South Staffs) for the 2nd Battle of the Scarpe (23rd -24th April) was simply the capture of Gavrelle. This was achieved and German counter-attacks were re-buffed, the line held and gains of 1 to 2 miles were made. Haig made plans for a major attack in May to encourage the French to continue their Aisne offensive. As a preliminary to this, an attack on 28th April was intended to get an improved starting line for May – the 2nd Division objective (which included the 2nd South Staffs) was the village of Oppy. The attack by 6th Brigade of 2nd Division was to be carried out by 17th Middlesex and 13th Essex with 2nd South Staffs in close support, with ‘C’ & ‘D’ Companies of 2nd South Staffs acting as support for 17th Middlesex for carrying parties and mopping-up duties. 17th Middlesex were to take 3 successive objectives, following a creeping barrage. At each objective, the leading troops were to consolidate whilst the next wave of troops passed on to the next. The 1st objective was achieved without undue casualties, but the advance to the 2nd objective was held up by German resistance and units either side not advancing as quickly. The creeping barrage moved away faster than the 17th Middlesex could manage and local German counter-attacks ensued. The Germans managed to drive between the 17th Middlesex and the 2nd Highland Light Infantry to their left, and to attack the 17th Middlesex (especially ‘A’ Company) from the flank and rear. The “moppers-up” – the 2nd South Staffs – had already been sent forward to strengthen the flanks, but in effect the 17th Middlesex were surrounded. the day had been disastrous for the 17th Middlesex and the companies of the 2nd South Staffs allocated to them. This attack was to be one element of what was to become known as the Battle of Arleux. 62 other ranks from the 2nd South Staffs were killed on 28th April, including William Perks; he has no known grave and is commemorated on the Arras Memorial. Missing: Private W. Perks, South Staffs.